Special Agent Kathryn Dance -- introduced in The Cold Moon -- stars in the latest thriller from New York Times bestselling author Jeffery Deaver. When Special Agent Kathryn Dance is sent to interrogate the convicted killer Daniel 'Son of Manson' Pell as a suspect in a newly unearthed crime, she feels both trepidation and electrifying intrigue. Pell is serving a life sentence for brutal murders years earlier that mirrored those perpetrated by Charles Manson in the 1960s. But Pell and his cult members left behind a survivor who -- because she was in bed hidden by her toys -- was dubbed the Sleeping Doll. This is Deaver's first book with Katherine Dance the Kinesics expert and while it's not my personal favorite it's still filled with all the twists and suspense he is so good at writing!! 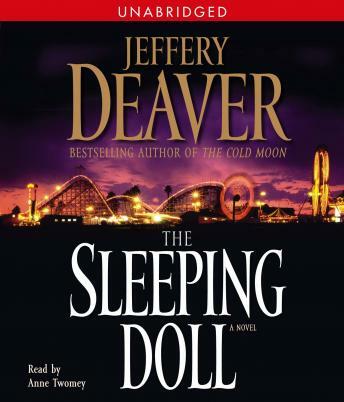 In my opinion it's not Jeffery Deaver's best but still an excellent listen!! Deaver introduces readers to Special Agent Kathryn Danse in Cold Moon, a Lincoln Rhymes series novel and then allows Danse to begin her own series. Danse is a great character who can tell when people are lying are trying not to. In this series beginning, Danse looks for a killer with a cult-like following that takes readers through an emotional roller-coaster all the way to the end. Great story and a serious tease of what is to come in in the tales of Danse.